Think that men’s wedding rings are just boring, solid bands? Think again. 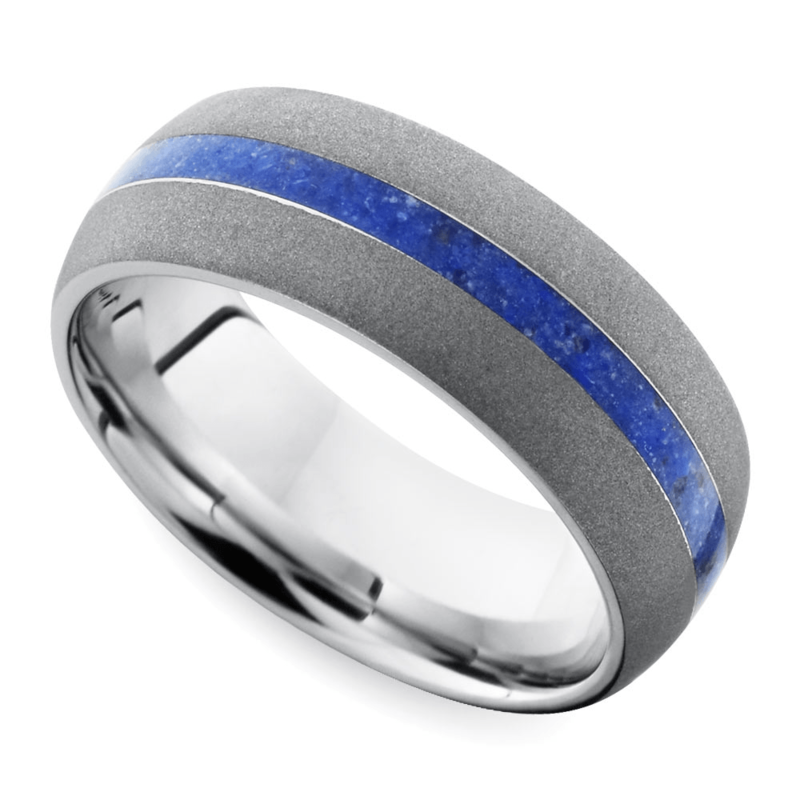 Although many men do opt for a simple style, quite a few are looking for more unique wedding bands. Today, there are hundreds of options to make a men’s wedding ring speak to who the wearer is as a person. 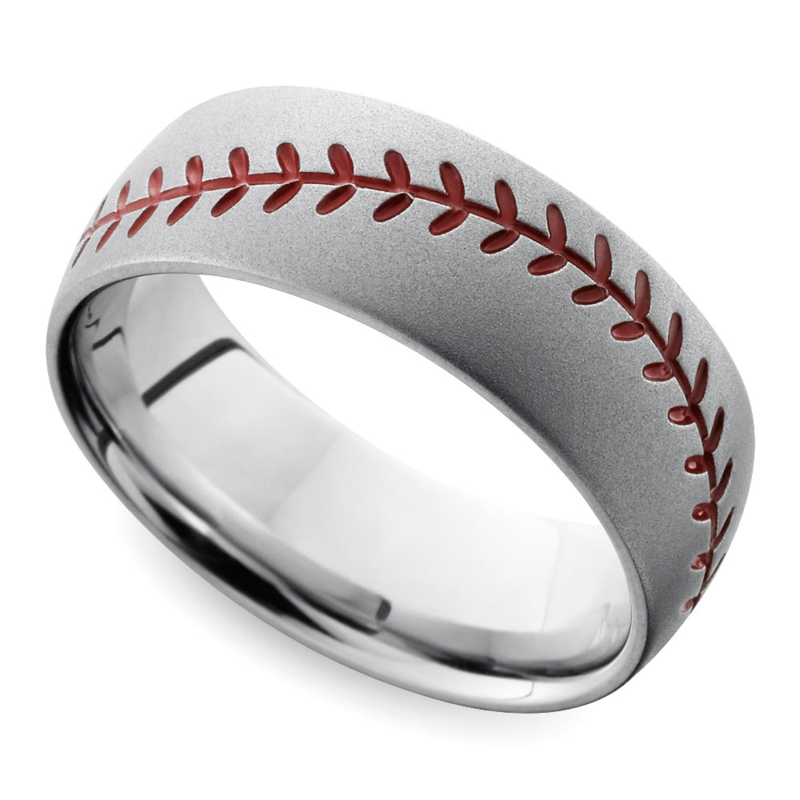 Men who are major sports fanatics, for example, have the option of incorporating their love for the game to create cool sports wedding rings. Or even engrave his band with a quote from a favorite player! 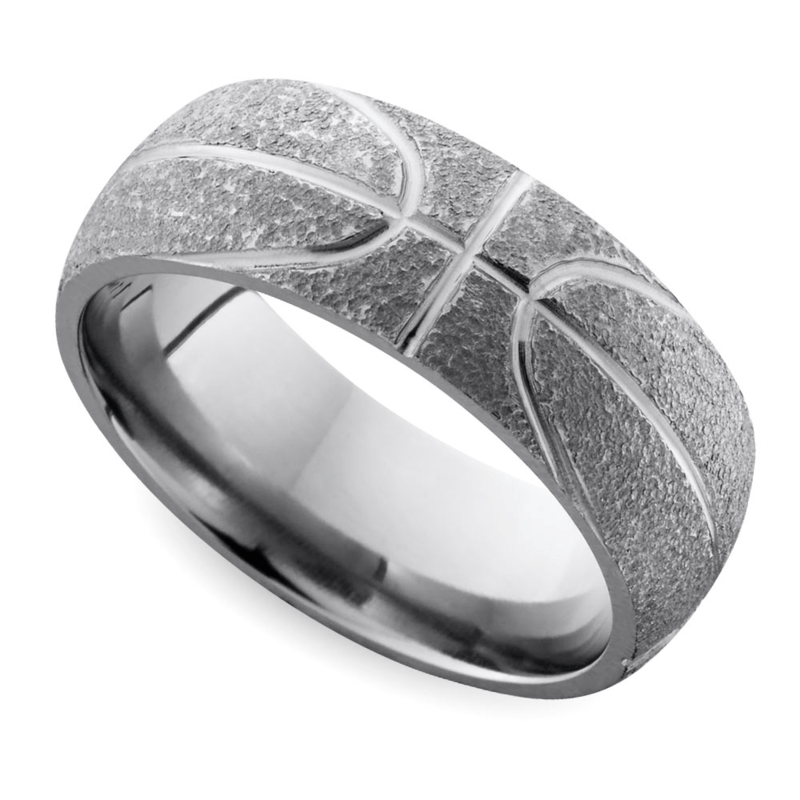 Choose His Favorite Sport: The Basketball Wedding Band…and More! One option for sports fanatics is to choose a ring style that reflects your favorite sport. Different ring finishes, colors and polishes can create the texture or appearance of a soccer ball, baseball, golf ball or even basketball. Although your future spouse may not like when you spend hours watching sports at home, they’ll love these sleek and sophisticated rings that speak to your personality. These rings allow you to keep the two loves of your life close to you at all times, your significant other and your favorite sport! Of course, for some couples, sports play such an important role in their relationship that they take the love of the game into the ceremony. Bands fashioned in the style of an actual game ball might not be for every man, but if he has a fun sense of fashion and a real love for the sport, these rings are perfect. These rings also lend to a more casual style, so if he leans towards a more formal demeanor, you may opt for another design. A more subtle way of showing your love for sports is to choose men’s sports wedding rings with some of your favorite team’s colors. Denver Broncos fans may love the Orange Antiqued Men’s Wedding Ring which is a cool, yet understated way to wear your team’s colors wherever you go. 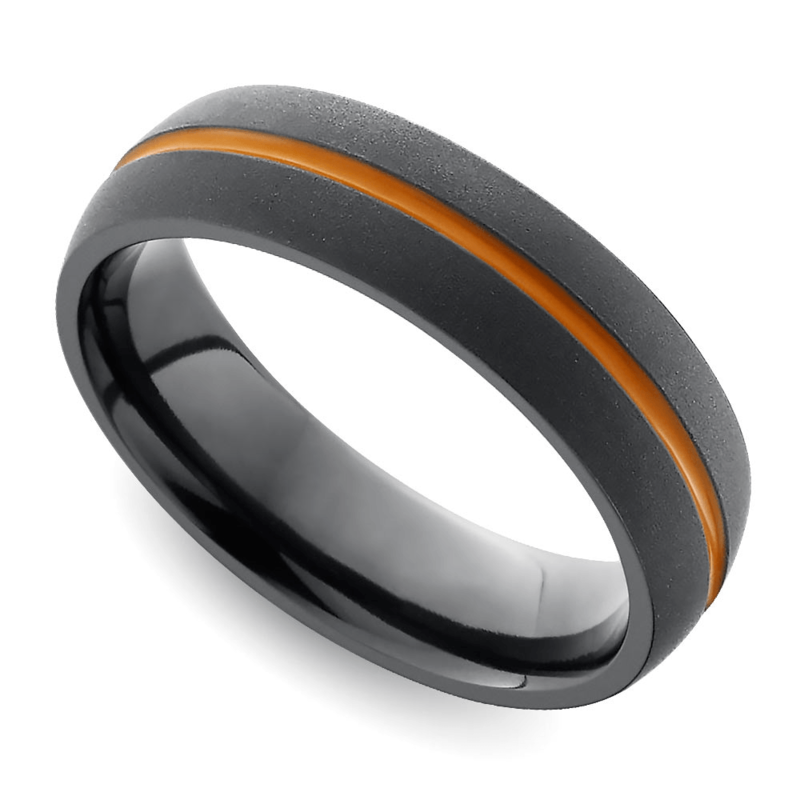 But orange isn’t the only color option when it comes to men’s sport wedding bands. Luckily, there are a number of different stones that can be used to add color, including lapis lazuli. Lapis is a beautiful shade of blue that will complement fans of the New England Patriots, Los Angeles Dodgers, Dallas Mavericks and more! If the band of color isn’t your style, there are other ways to add your team’s colors, such as setting gemstones into the band. Beautiful sapphires, emeralds, or rubies can be placed into bands to add a pop of color and team pride. Gemstones and decorative inlays also look incredibly sophisticated on the finger. If his work environment is more business formal, then a ring featuring a more intricate style will match his dress code formality. If you choose to incorporate precious gemstones (like rubies, sapphires and emeralds), select a metal setting that showcases the hues of the stones. Use lighter metals like white gold and platinum (or palladium) to accentuate cool toned gems like sapphires, amethyst, peridot or emeralds. Yellow or rose gold showcase the warmer hued tones like rubies and garnets. If you’re incorporating yellow hued gems like yellow topaz or citrine, choose yellow gold instead of rose gold, as the copper undertone of rose gold does not mix well with yellow gems. Choose a wedding ring that can be engraved so you can honor both your future spouse and your favorite home team. Men can have the ring engraved on both the inside and outside of the band, so you can choose to keep your love for the home team private, or wear it with pride. Engrave the date that your team won the championship on the inside, and the date you married the love of your life on the outside. Or, engrave your favorite player’s jersey number that also just so happens to be your lucky number. With a variety of fonts to choose from, men can even have the engraving match the font of their favorite sports team’s logo! 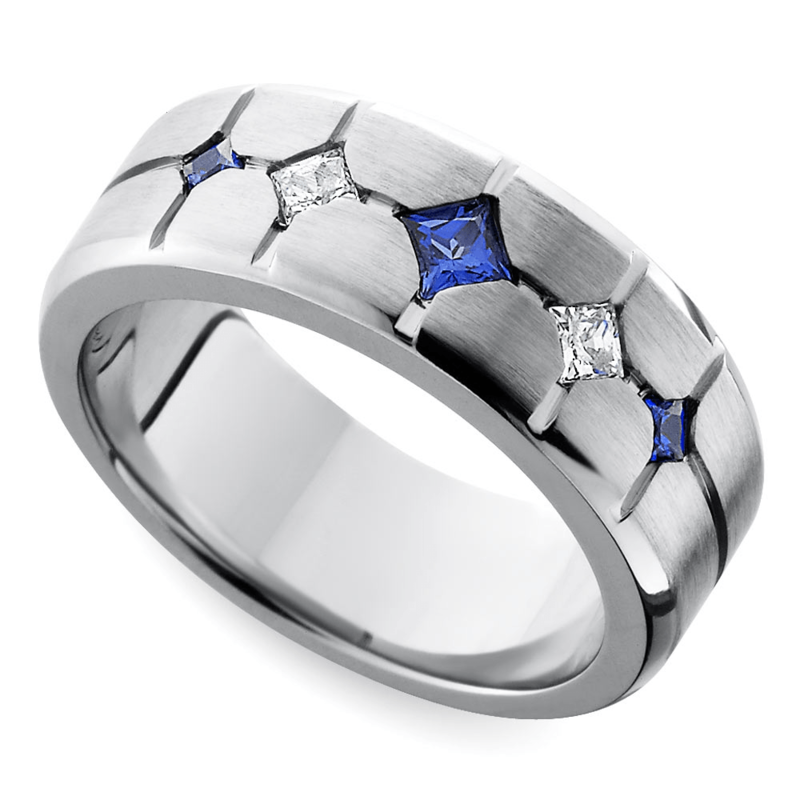 Men’s sport wedding rings can also be completely customized with more unique designs and motifs. Add tennis racket etchings onto a band and include a tiny yellow diamond for the tennis ball. If he loves Nascar, customize men’s sports wedding bands that put the pedal to the metal. Design an eternity style band that includes black and white diamonds styled as the checkered flags! The edges of the band can also be engraved to resemble tire treads! No matter what sport he loves, you can custom design a band that incorporates his favorite pastime. And, yes, even fishing counts! So don’t think twice about adding fishing poles or even an etched catfish onto that band!